If your kitchen countertops and cabinets are a mess, proceed. 1. A two-tier shelf that'll help you get the most out of tight corners. 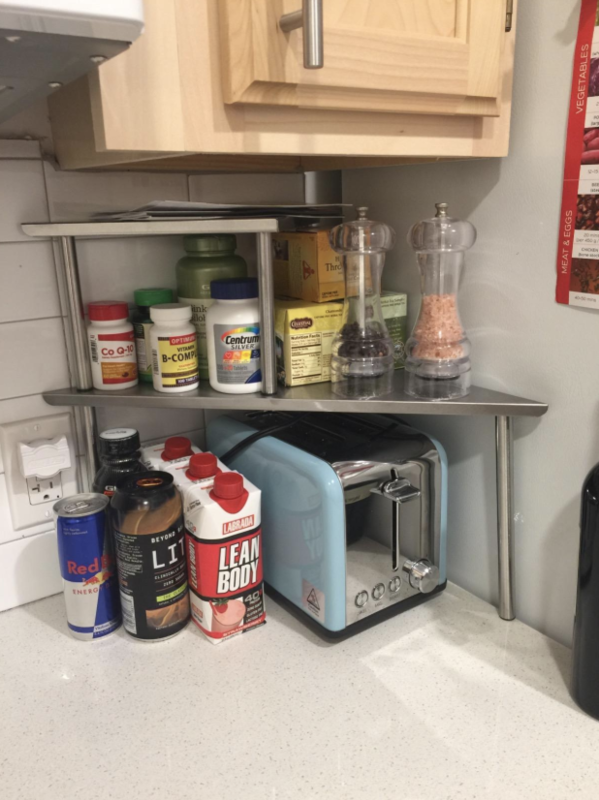 You can stack spices, vitamins, and really anything else that may be overflowing from your cabinets. You can also use a shelf like this in your bathroom to help with counter space! 2. An over-the-cabinet door organizer for various items like cutting boards, wax paper, and aluminum foil. It can also be mounted to a wall if that's more your style. You could also use this basket as a garbage receptacle. All necessary hardware is included! 3. A plastic bag holder so you can finally become a civilized human being and stop storing random plastic bags within other plastic bags under your sink. Yes, we do it too. 4. A set of OXO airtight containers, because nothing stays fresh in its original packaging nowadays. The circular center pop-up button creates a vacuum-like seal. 5. A baker's rack or microwave cart for additional vertical storage to free up your counter space. Both feature a wood cutting board and space for hanging pots, pants, and utensils. 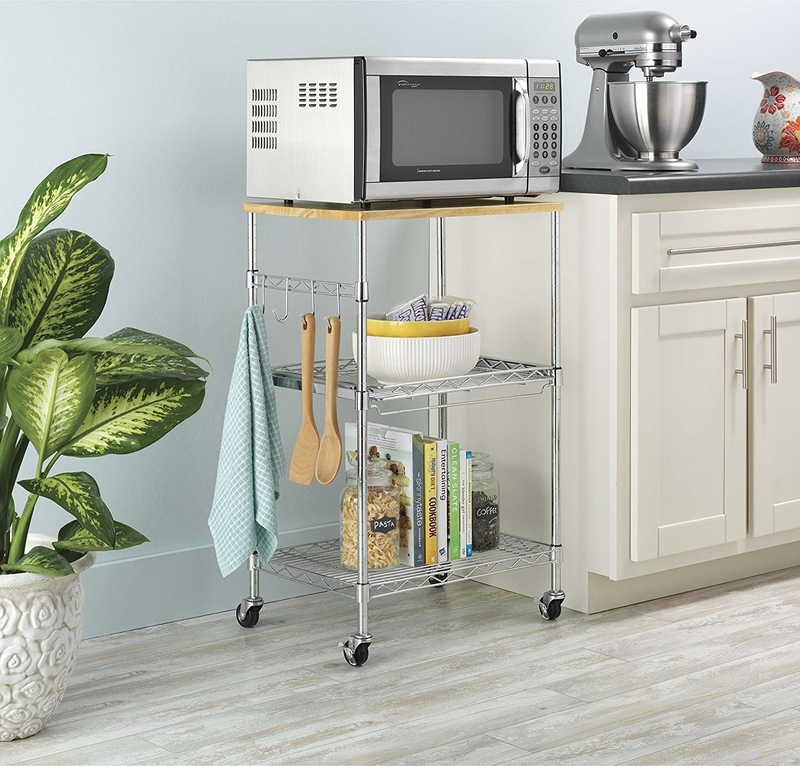 The baker's rack is stationary, but the microwave cart has wheels for easy transport around your kitchen. 6. A K-cup holder that'll fit up to 40 cups and has drawers that lower to eye-level so you can easily see your collection while trying to make coffee in the morning. 7. 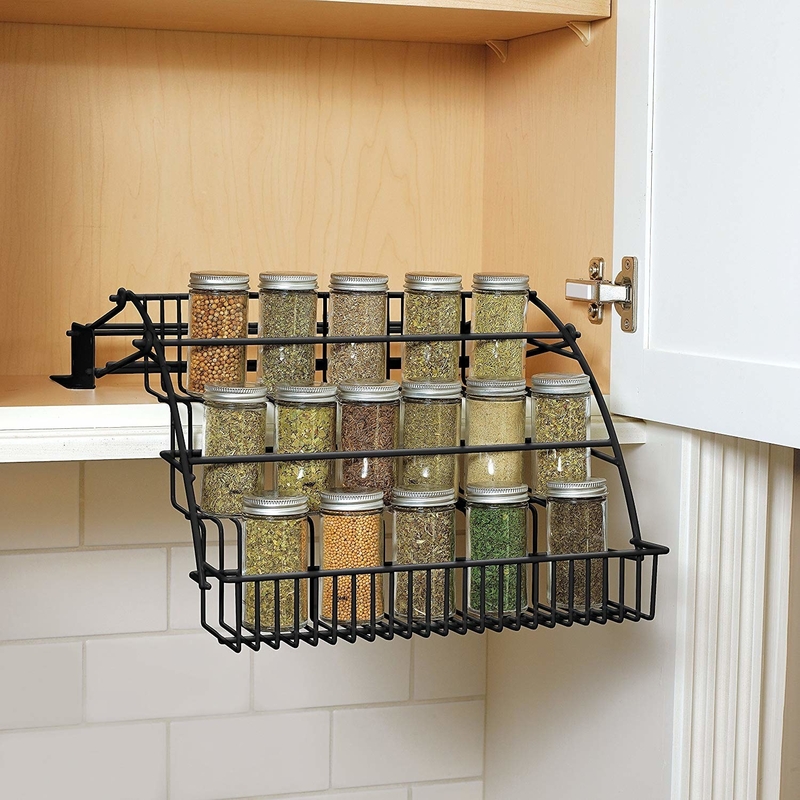 A tea bag organizer with 12 removable bins so you can rid of all those boxes that take up so much room in your cabinet. This single organizer holds over 100 tea bags!! 8. A magnetic strip to hold knives and kitchen tools that are probably crammed in a drawer right now. This strip will make them easily accessible while cooking. Don't worry about things dropping — this magnetic strip is very strong and holds from end to end. 9. A mounted rack for pots and pans, because trying to stack them in a cabinet is literally impossible. Plus, the S-hooks are included! All mounting materials are included, plus instructions! 10. A sponge and brush holder so each can properly dry after use. With three suction cups, this holder won't budge. 11. A spice shelf that'll hold up to 40 pounds, transforming your current collection so you can actually find what you're searching for. No more fumbling mid-recipe! 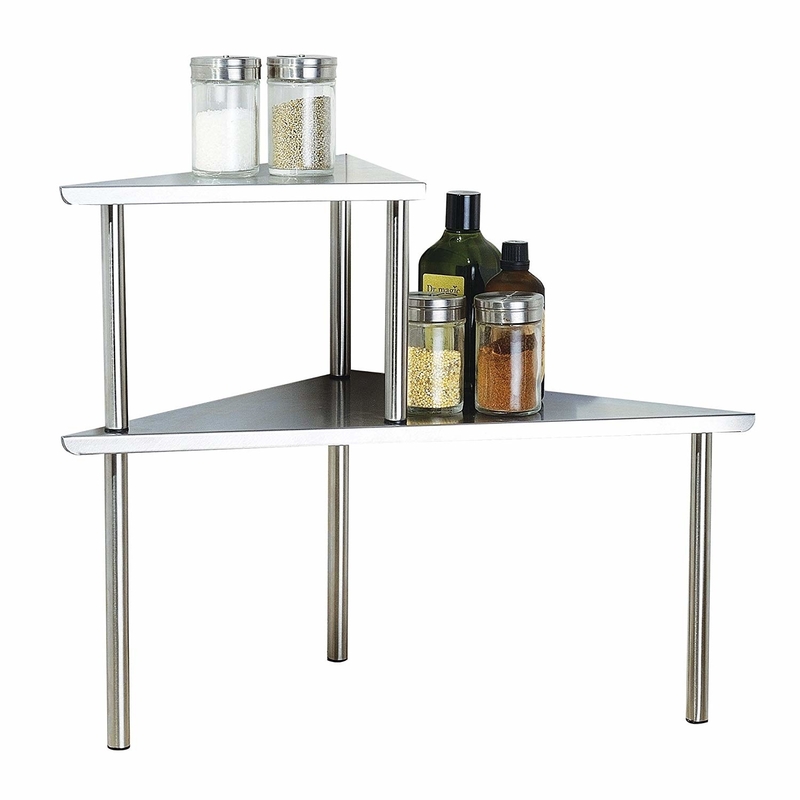 The shelves are stackable and come with different sized legs for short or tall spice bottles. 12. 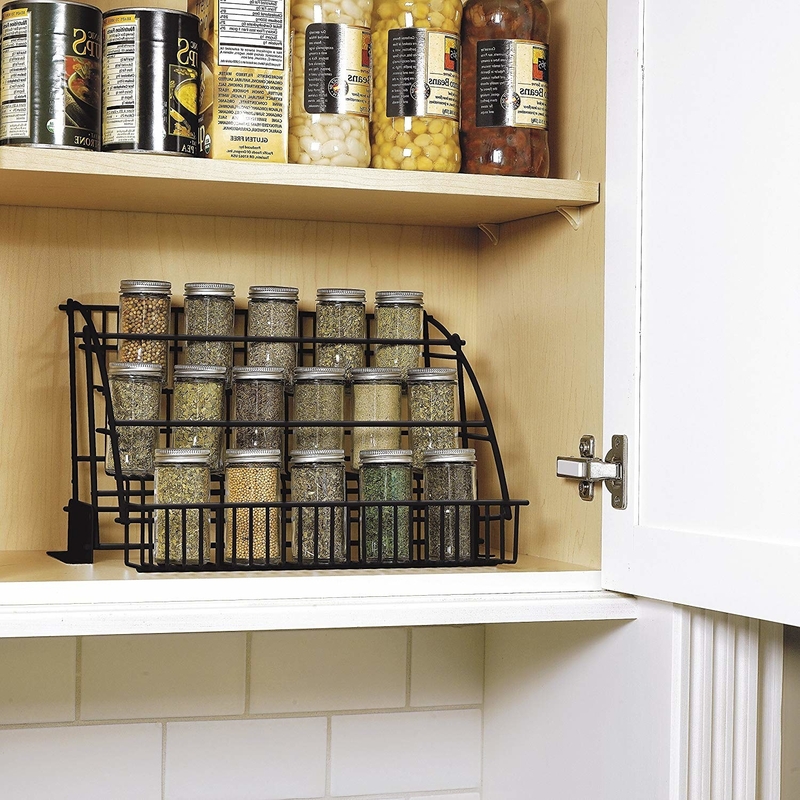 Or a pull-down spice rack to get everything within arm's reach and make use of vertical space within your cabinet. 13. A 14-inch tip out tray so you can actually make use of those faux drawers below your sink. Heads up — installation can be difficult in yours don't open very wide. 14. Stackable shelves for your cabinets, countertop, or even refrigerator and freezer. They can be stacked on top of each other or side by side. 15. A three-tier hanging fruit basket to corral all the fruit you recently bought at the farmer's market and now have to eat before it spoils. 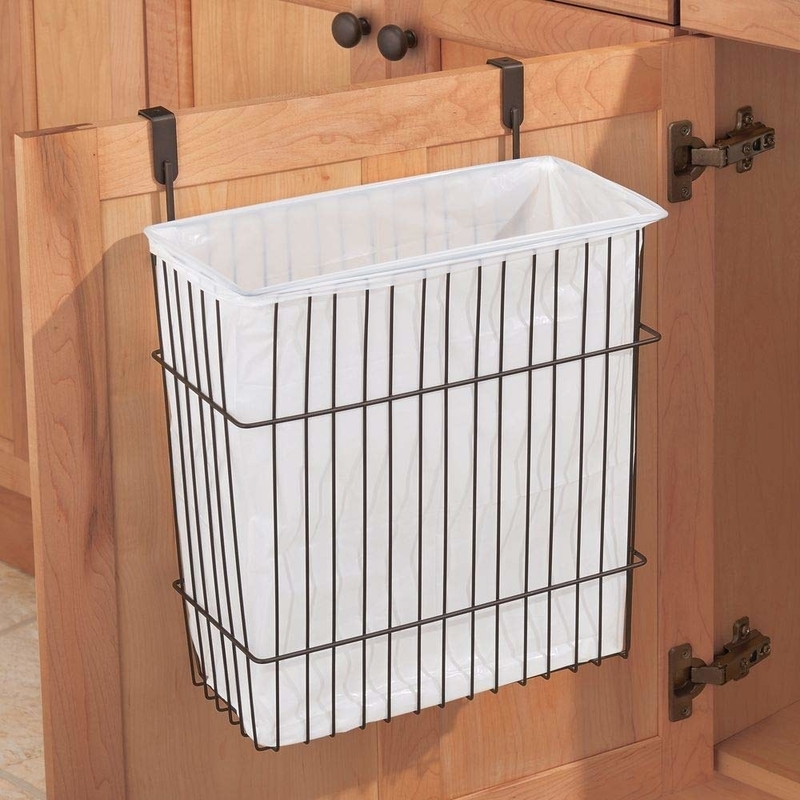 You can unclip the baskets if you want them on your countertop, plus you can adjust the chain length if it's too long. 16. A modular, 12-bottle wood wine rack that can be added to over time and configured to your needs. 17. Airtight cereal dispensers with circular pop-open holes for easy pouring. When they need cleaning, just stick them in the dishwasher! 18. 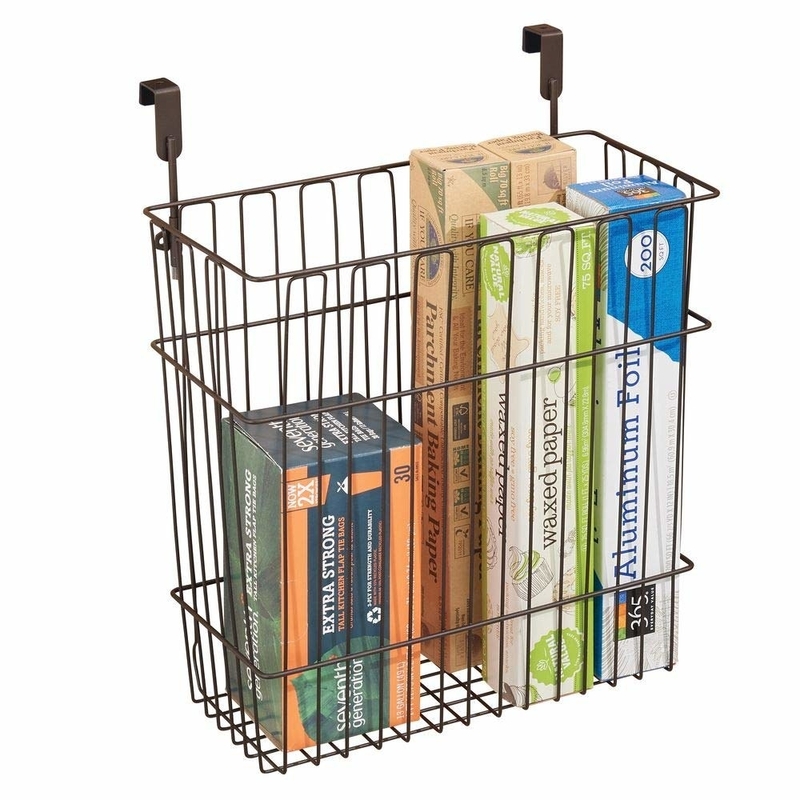 A bakeware rack to provide a home for all your tins and pans that are currently residing in your oven. Seven dividers are included, but are totally adjustable based upon your needs. Promising review: "I love this thing. I was able to store my all my bakeware and cutting boards. I was pleasantly surprised to have more then enough space to add my kids' trays and square plates. I used to have a lot of these items stacked on top of each other, which was bulky. This thing is such a time saver and it looks nice on the eyes. 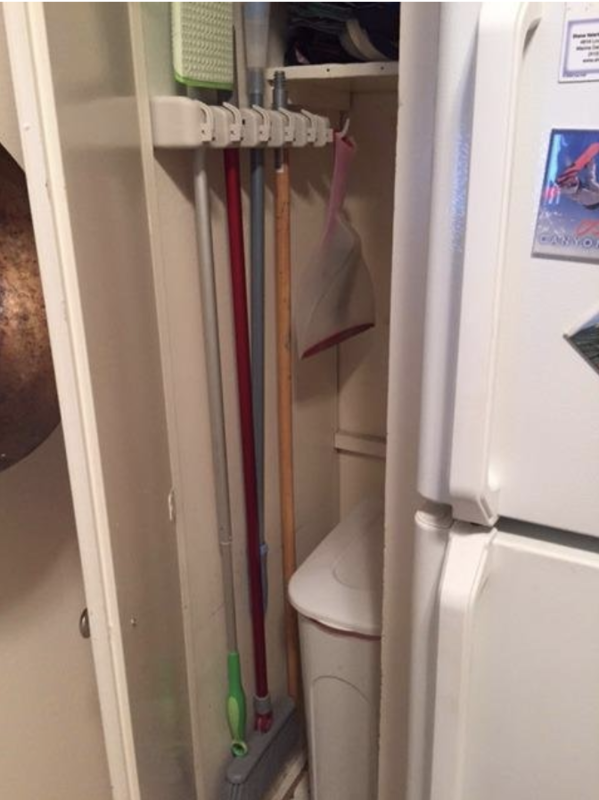 I placed this in an upper shelf so I don't have to bend over to get the things I need." —J.R. 19. 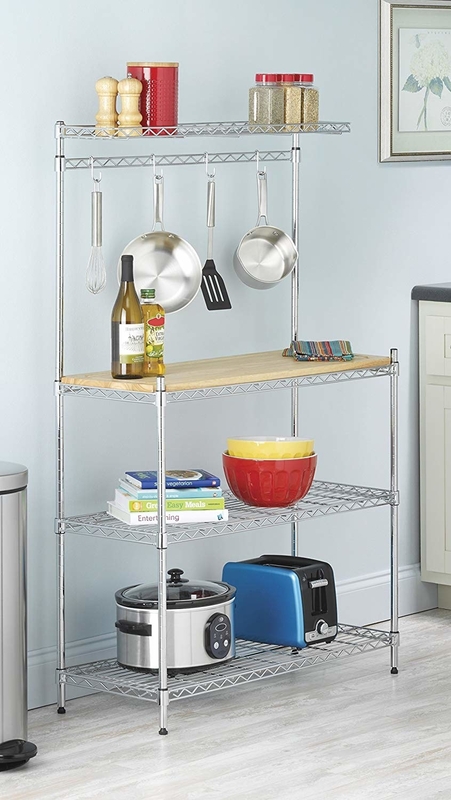 A slim four-tier rolling rack that'll fit in otherwise useless narrow spaces. Like that tiny opening between your fridge and counters, or your fridge and the wall. 20. An expandable shelf to organize that black hole under your sink where things just pile up with zero order. This is a great solution for cleaning supplies! 21. Nesting storage containers so you don't waste space when they're not in use. 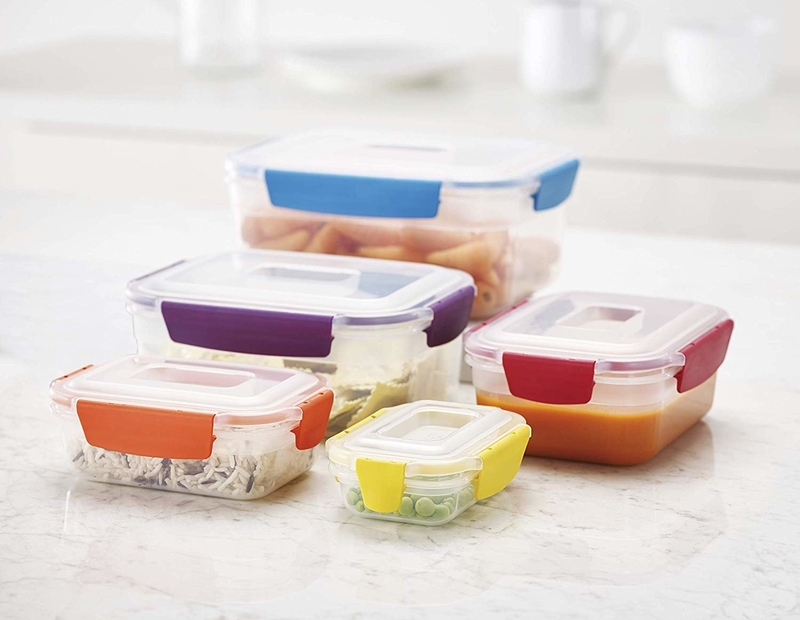 The lids will lock down for airtight and leak-proof storage. They're also freezer-, dishwasher- and microwave-safe! 22. A paper towel holder with a built-in shelf for kitchen essentials like dish soap, olive oil and vinegar, and spices. It'll mount to the wall via two screws. You could even use it for toilet paper in your bathroom. 23. 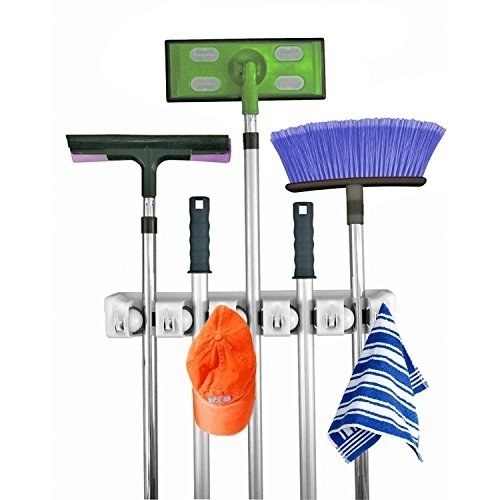 A mop and broom holder to bring order to your cleaning supplies cabinet, because leaning mops and brooms together creates insane clutter. This holder also has six hooks for rags and towels. 24. 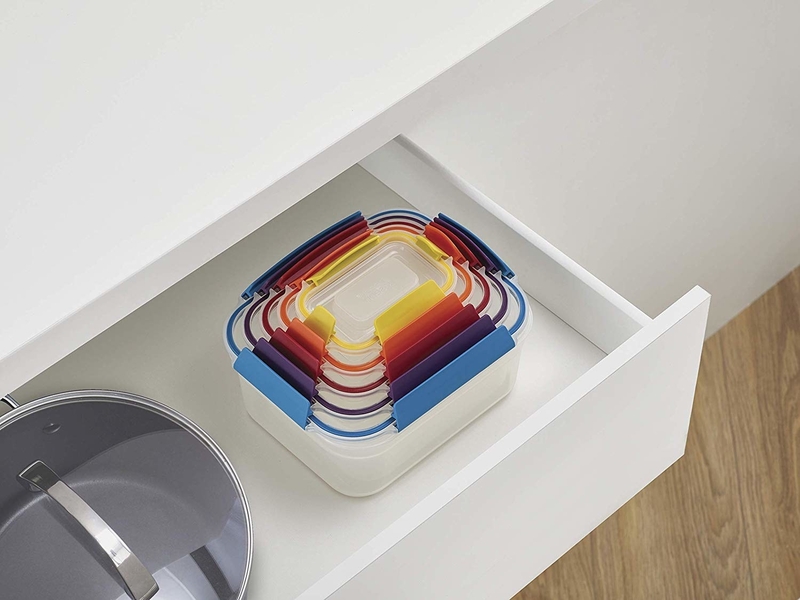 A bamboo expandable cutlery drawer that'll finally organize the lump of forks, knives, and spoons you have sitting in a drawer. This one comes with cushioned pads so the organizer won't slide around or clunk against the inside of your drawer when opening. 25. A rolling, 50-pound pet food container to keep your pooch's food fresh and away from their pesky paws. 26. A mug tree, because we all know how easy it is to collect mugs and then wind up with about 30 sitting in a cabinet untouched. This holder will store up to six mugs so you always have one on-hand for your morning brew. 27. A cabinet to attach to the side of your door for increased space. It'll integrate into the door's hinges so it can swing open and closed. Think of it like an added pantry!